Jennifer Coleman leads a breakout session on “Addressing the Misconceptions of Food.” Coleman is Communications Coordinator Director and lives near Columbus. Marlene Eick, keynote speaker at St. Michael Hall in Fort Loramie, shares personal experiences about taking that first step in order to complete a seemingly difficult task. Eick currently chairs the Ohio FFA Foundationճ Board of Trustees and lives near Wooster, Ohio. 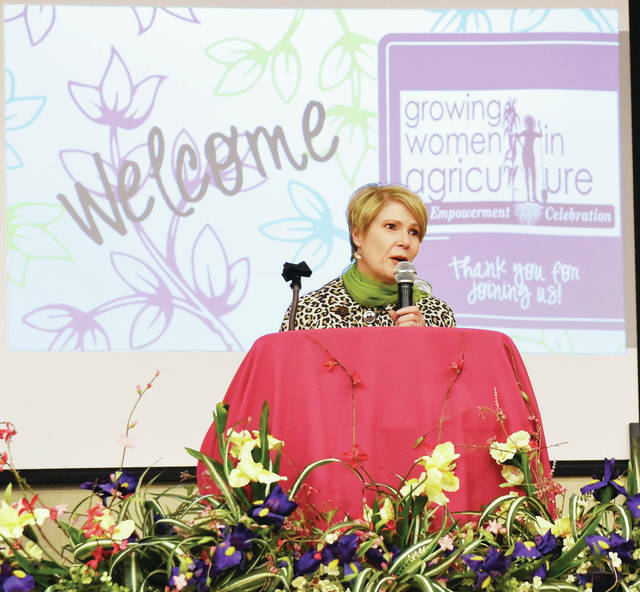 Dorothy Pelanda, Ohio Director of Agriculture, Marysville, was a surprise guest at the Women in Agriculture event. 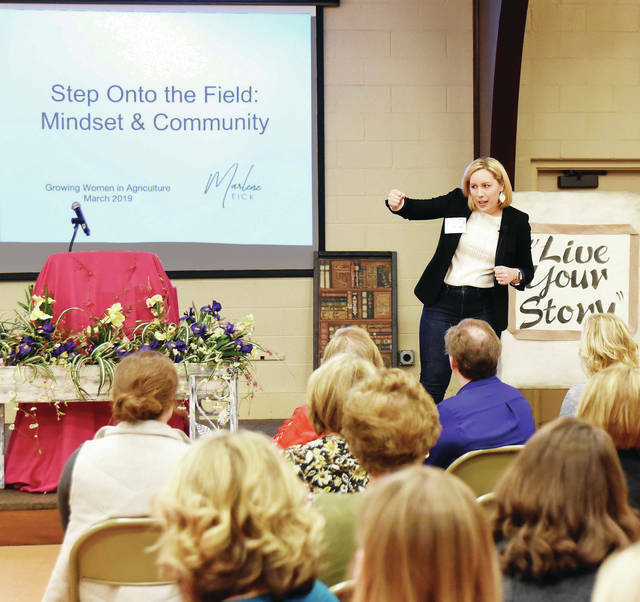 FORT LORAMIE — To celebrate and honor the rising number of women in agriculture throughout the United States, the agriculture community in Shelby County convened the fifth annual “empowerment celebration,” Thursday, March 28, at St. Michael’s Hall. All three Shelby County Commissioners were in attendance, with Bob Guillozet and Tony Bornhorst assisting with providing food and wine to attendees, and Julie Ehemann welcoming the crowd of around 120 women. Ehemann added that, each year, a portion of the Women in Ag event’s proceeds are donated to local organizations to help women in crisis. This year, the chosen organization is Rustic Hope. Rustic Hope provides support to single mothers before, during, and after delivery, providing help for things like daycare, diapers, housing, and emotional support. Also in attendance was Director of the Ohio Department of Agriculture Dorothy Pelanda. Eick shared with the audience a bit about her experience growing up on a farm in northwest Ohio, and described her transition into adulthood and business woman as one rife with uncertainty and second-guessing. Eick went on to say that mindset and community are two important aspects of setting and reaching goals, whether personal or professional. “Sometimes the thing that we struggle with is, ‘What direction do I really want to go?’ So often, we’ll have an idea that we’re not sure about; maybe we want to do something with our farm or our business, but we don’t know exactly where we want to go, and you know what we do? We just stand there and wait and think, ‘I can’t do anything; I can’t start anything until I’ve got everything exactly figured out,’” she said. As for “community,” Eick explained that the people in your life are just as important when it comes to achieving goals. “It’s not just about mindset,” she said. “It’s also about the people you have with you. The people around you matter; your community matters. That might be the people that live in the same house as you, it might be your extended family, or the people with you at work, or in the community groups you’ve chosen to join; but those voices in your life matter. Following Eick’s segment, attendees were split into four break-out sessions. Each participant was able to sit through two session topics. One of the sessions focused on the misconceptions surrounding food, which was presented by Jennifer Coleman of the Ohio Soybean Council. Coleman addressed the issue of Genetically Modified Organisms (GMOs) and the role this science plays within the food and agriculture sector. 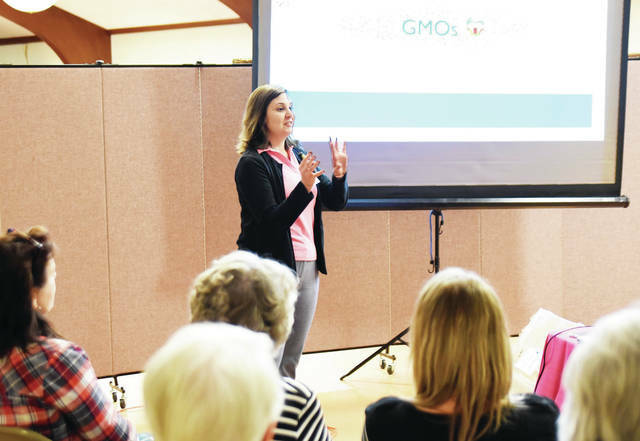 She specifically spoke about misconceptions regarding GMOs and the “noise” that contributes to these, and the role this plays when trying to educate someone about the facts behind the science. Coleman went on to say that effective communication starts with listening, specifically to those preconcieved notions that consumers may have regarding GMOs. Genetic modification of plants has taken place for many years, and according to Coleman, one of the benefits of modern day use of GMOs within the farming sector is that it can lead to decreased usage of pesticides. Coleman also shared a list of scientific organizations from around the world that claim GMOs are, in fact, safe for people and the environment. To learn more about GMOs, visit GMOanswers.com. Another break-out session focused on “farm and family photography,” and was presented by Lindsey Whetstone, owner of Lindsey Whetstone Photography. Whetstone said her love of photography began as a child, eventually morphing into a long-term career. Her goal of the evening was to educate those with an interest in photography on how to further explore and develop within the subject, while also giving tips on how to create memories of their own families. One tip Whetstone gave when it comes to photographing your family, specifically children, is to join in. Whetstone went on to share tips for ways to get the best captures with a simple phone camera. To learn more about Whetstone and her photography business, visit lwhetstonephoto.com. A third break-out session focused on the role of women in agriculture, presented by Rose Hartschuh. Hartschuh shared statistics about women in agriculture, including that there are 31,413 women farmers in the state of Ohio, who are responsible of a combined total 3,883,067 acres of land. Women make up 28 percent of farmers within the state. Hartschuh went on to highlight “Cool Women in Ag,” including the Giles sisters, Jenny, Katie, and Molly, from Ashland, Kansas, who own and operate Giles Ranch, a fifth-generation Angus ranch. To learn more about Hartschuh, visit www.rosehartschuh.com. The fourth session was titled, “Selling Directly to Consumers,” and was hosted by Jess Campbell, livestock farmer and owner of Carroll Creek Farms, in Waynesville. As a farmer, Campbell has gotten creative with how the product she produces is sold, one of those being consignment. Campbell also talked about her creation of a “meat retreat,” as a way to allow customers to visit her farm. “I basically built a cabin on our driveway where people can come in,” she said. “We have freezers stocked and they can grab on the honor system and pay with Venmo, credit card machine, checks or cash, grab their meat, check out, and go. To learn more about Campbell’s farm and business, visit www.carrollcreekfarms.com.